The Internet is huge! If the Internet was a country it would effectively have taken over the entire United States and doubled in size every year. That's a lot of Internet! So what does this have to do about NAT? Why does the size of the internet even matter? Let's take a quick step backwards, before we start confusing you even more. When a computer needs to connect to another computer it requires an IP address. This IP address is a unique number that identifies the location of your computer on a network. Think of a street address for your home that determines exactly where you are so packages can be delivered to you. A long time ago when IP addressing first came out everyone thought that we would have more than enough addresses to cover everyone. Since the Internet keeps growing in size however that is no longer the case, and because of this we will not have enough IP addresses to cover the future growth of the internet. So basically we're running out of available IP addresses to give out to people who are using the internet. One way to help lighten the burden of too many devices connecting to the internet is by using NAT. Network Address Translation or NAT is used by a firewall, router, or computer and sits between an internal network and the rest of the world. The primary purpose of NAT is to take any amount of devices you have on your local network and allow them to use a single and unique IP address on the Internet. Select "My Xbox" and then select "System Settings"
Select "Wired Network" or the name of your wireless network, if you are prompted to do so. Select "Test Xbox LIVE Connection"
Depending on what your NAT type is will determine whether or not you will be able to join or host a specific multiplayer game. 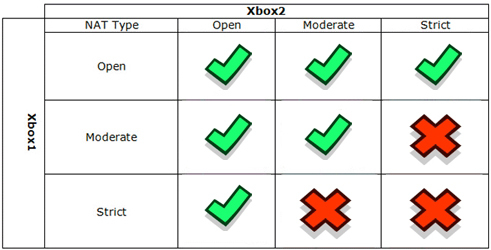 As shown in the table above, Xbox LIVE will allow consoles with Open NAT Types to connect to both moderate and strict connections. Strict connections however can only connect to Open NAT types. Basically this means if you're current NAT type to the Xbox LIVE network is showing up as Strict you will only be able to join games for those connections that have Open NAT types. Universal Plug and Play (UPnP) is a standard that helps routers communicate effectively. If your router or gateway supports UPnP, make sure this setting is turned on. Please refer to your hardware documentation for help turning on UPnP. Most hardware manufacturers have websites that include support information. If you change the UPnP setting on your network hardware, restart your hardware and test your Xbox LIVE connection. Your router or gateway might be having problems sharing an Internet connection. To see whether this is true, try simplifying your setup. If you have a wired connection: Temporarily unplug everything from your router, except the cable to your modem and the cable to your Xbox 360 console. or If you have a wireless connection: Temporarily turn off everything that's connected to your wireless network except your Xbox 360 console. Test your Xbox LIVE connection. To do this: go to My Xbox, select System Settings, select Network Settings, select Wired network or your wireless network name (if you are prompted to do so), and then select Test Xbox LIVE Connection. If you do not receive a NAT warning after simplifying your setup, it suggests that the router is having problems handling multiple connections. To try to fix the problem, please go to the next solution. If you're not connected to a workplace or college network, you need to open network ports on your network hardware. For more information on how to open these ports please visit the Microsoft Support Site, located HERE. For more information about NAT types and a detailed explanation for each type and how it connects to other machines please visit the Official Engineering Blog at Xbox.com located HERE. Type 1: Connected directly to the Internet. Type 2: Connected to the Internet via a router. Type 3: Connected to the Internet via a router. According to Official PlayStation documentation (located here). Type 3 connections may not be able to communicate with other PS3 systems, as well as use voice / video chat communication features. Over the years we have discovered commonalities with home network settings that, when addressed, have fixed certain connection problems related to NAT entirely. Many of these issues can be easily fixed by adjusting your router/console settings. Make sure your NAT is type 1 or 2. Make sure UPnP is set to available.